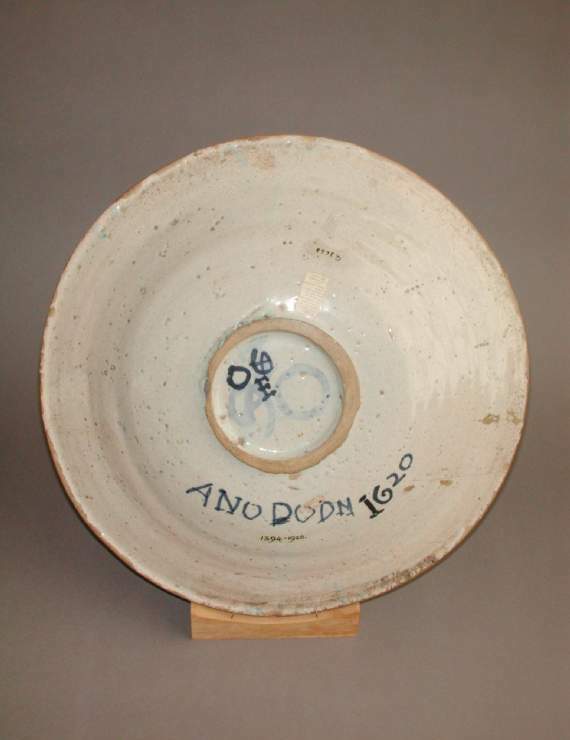 This post is my last one about Pottery of the Post Medieval times and, as stated in previous posts I have chosen some of the most famous pottery manufacturers as well as my favorites.I will however give a few other popular pottery manufacturers which you may be interested in to study, with a view to collecting in the future. 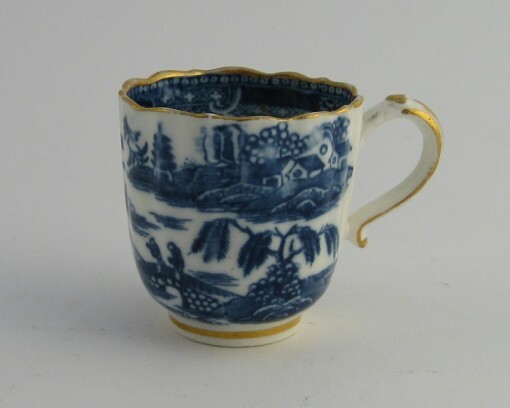 During the Coalport- Caughley period decoration in the factory was chiefly painting and printing in underglaze blue, with a small amount of enameling. 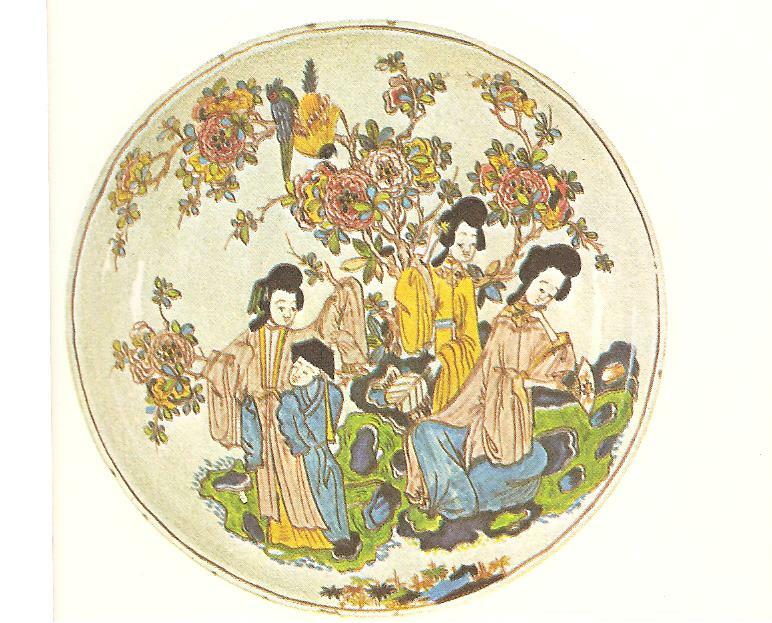 Dinner services decorated with chinoiserie scenes, in imitation of the blue painted Chinese export wares were especially popular , helped by the fact that East India Company had ceased to import Oriental wares. 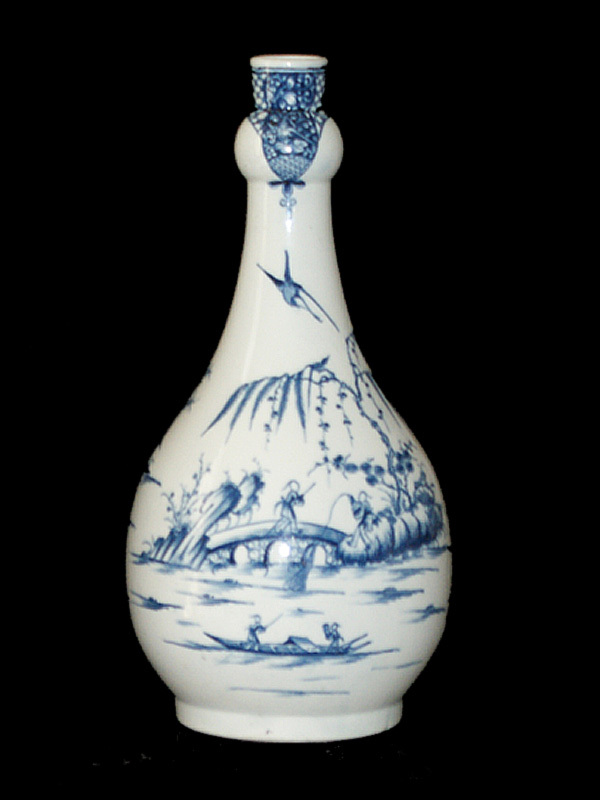 The outstanding designs followed Caughley and included the famous Willow pattern and the Broseley dragon printed in blues-a pure cobalt and lavender- touched with gold. Painted decoration was minimal on ordinary table ware with simple floral designs.Excavations carried out at the Caughley site clearly identified a popular form of plate with six regularly spaced indentations around the rim, they are of a type that was obviously among those sold in the white glazed state to outside decorators. 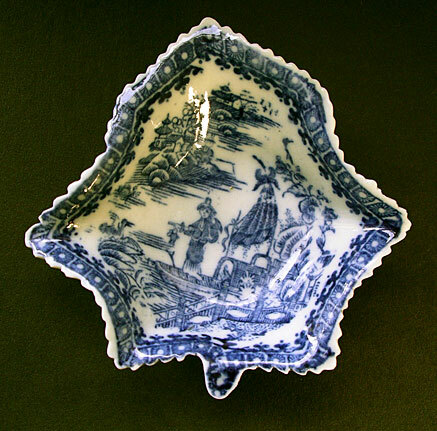 Caughley Blue and White Pickle Dish c l800. 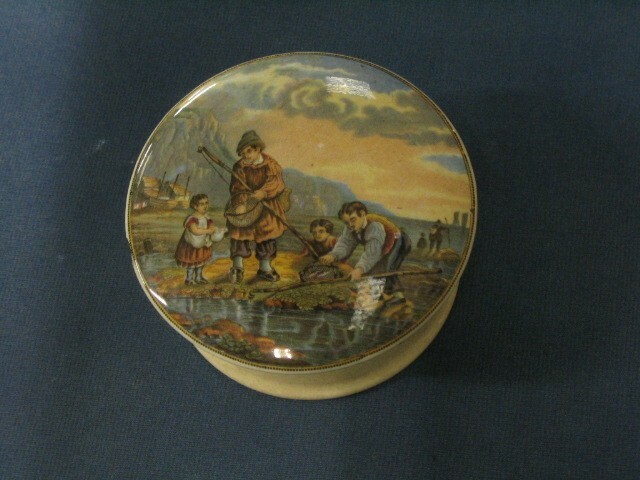 Fisherman and Cormorant pattern. 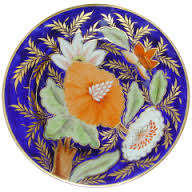 During the l800s the Coalport factory produced a range of shapes and patterns but the” Japan ” patterns with their areas of deep underglaze blue and overglazed red ,green and gilt embellishments are prominent. 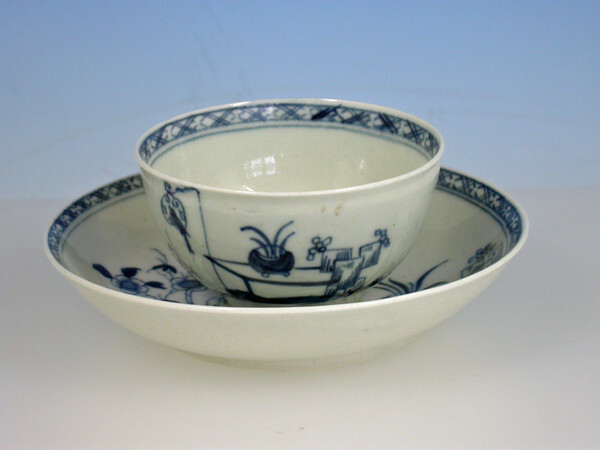 These Japan patterns are associated with the Derby factory but they were common to most ceramic manufacturers. 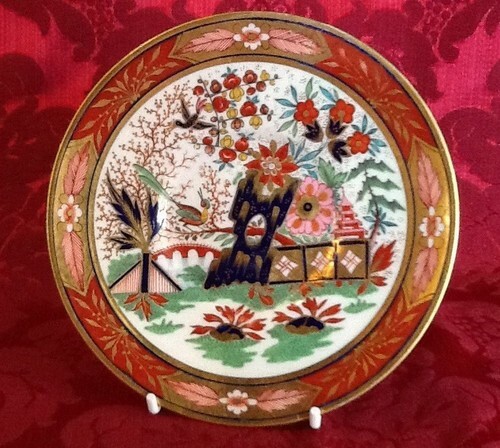 Coalport Dessert Plate Imari design c l8l5. 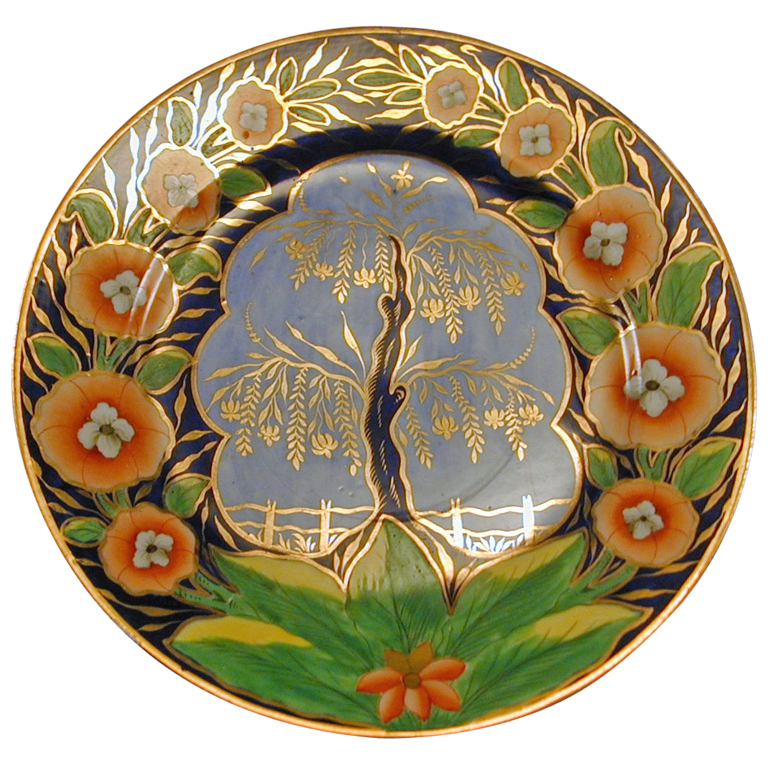 The blue and white is usually my favorite but this Coalport Tree of Life pattern is exceedingly beautiful. 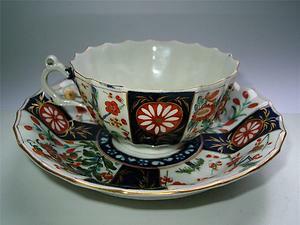 Soon after l8l0 Coalport china was recognized by its soft white tone, clear surface and creamy translucency. Further technical improvements in the early l820s it was made yet more purely white, finer textured, with a high white translucency. 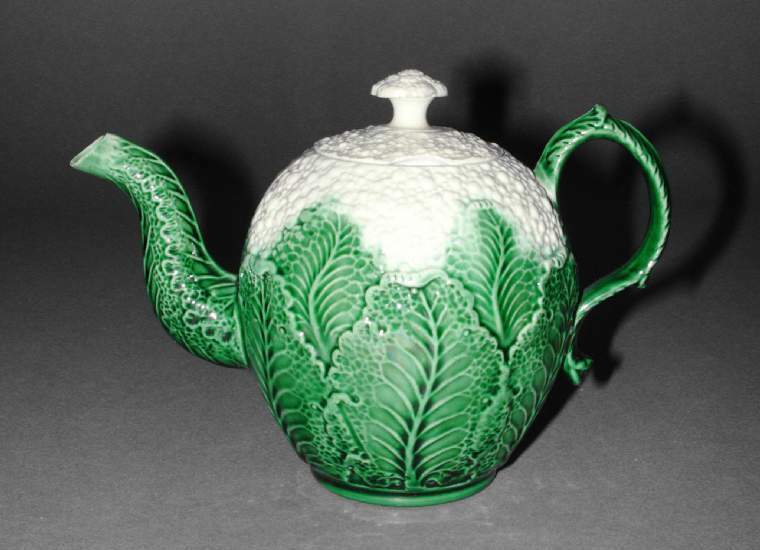 A soft, smooth lead glaze was used until l820 when John Rose introduced his celebrated leadless glaze, hard, transparent and highly lustrous. 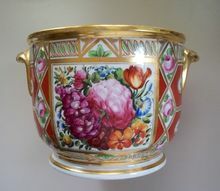 The presence of lead in the glaze had an advert effect on the enamels laid over it, particularly the sensitive tints and those prepared from gold oxide. 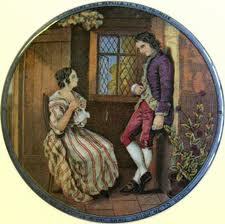 In l82l Samuel Walker introduced a beautiful maroon ground which became a Coalport characteristic. 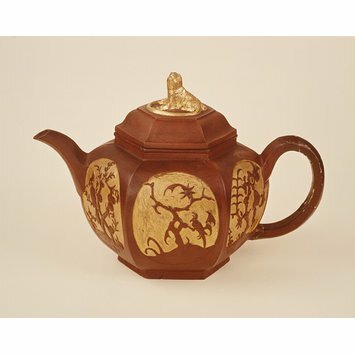 Decoration became richer and more varied and in the reign of George lV; splendid dinner, dessert and tea sets were issued in brilliant colors with highly burnished gilding. 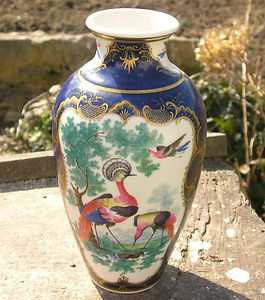 From the l830s highly ornamented, rococo shapes and flower- encrustation on items such as vases, clock cases, ink-stands. 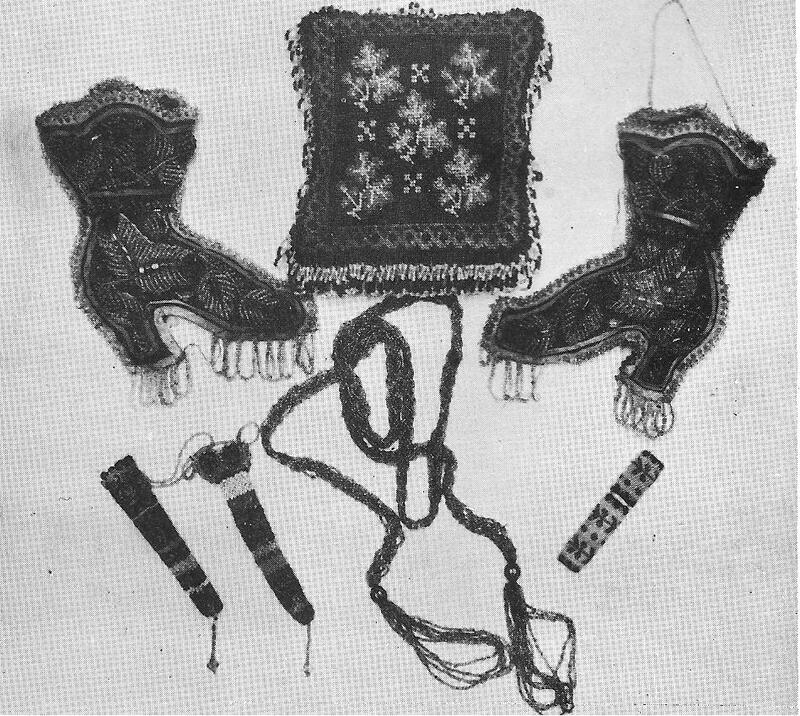 baskets, jugs and pastille burners were overlaid with masses of small flowers. 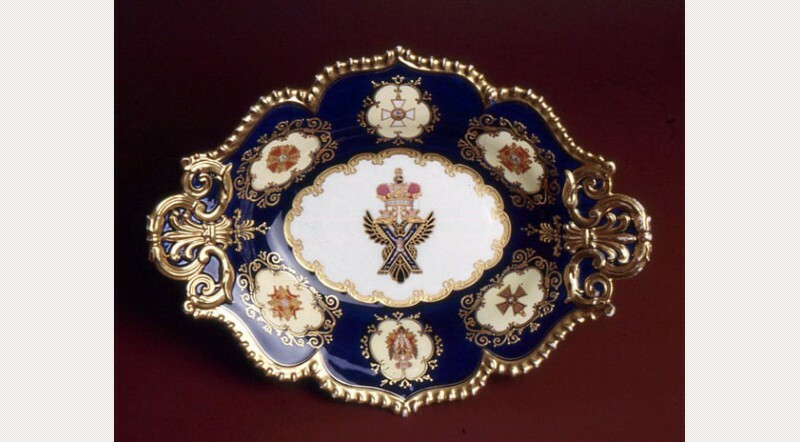 These flower encrusted wares are usually known as Coalbrookdale and maybe so marked in blue. 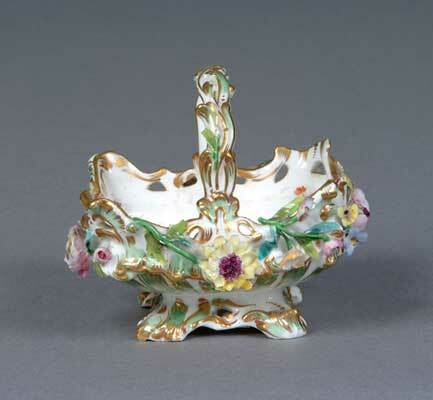 Coalport was the first English pottery to reproduce the famous “rose pompadour” for which a gold medal was awarded at the Great Exhibition.l85l . 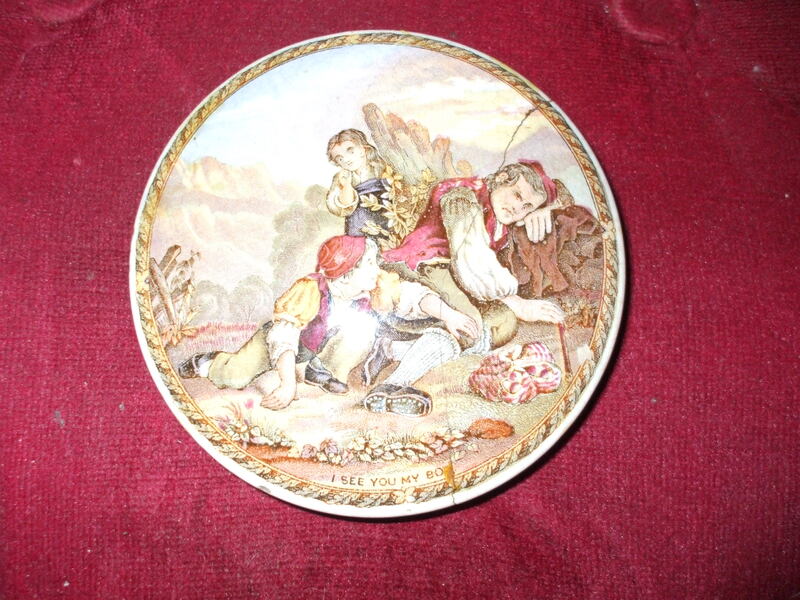 Below are some Coalbrookdale-Coalport marks to be found on some of the pottery items. 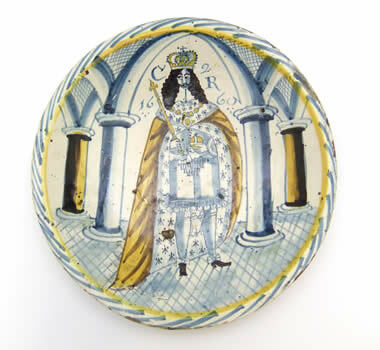 Here as promised, are a few more names of popular pottery manufacturers from the 18th-19th centuries you may like to research yourselves should you be interested. 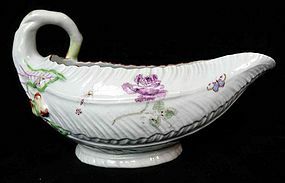 Parian Ware was popular in Victorian times because of its marble like beauty and because it was inexpensive to buy at that time. 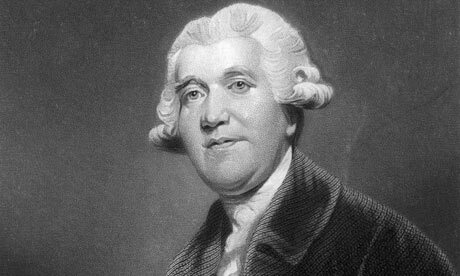 Several English factories claimed credit for its development. But the Staffordshire firm operated by William Taylor Copeland and Thomas Garret was the first to produce and sell it in l842. It was produced by other manufacturers but called a different name. Copeland called it “Statuary Porcelain ” . 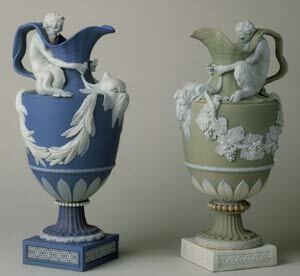 Wedgewood named it “Carrara” but it was Minton who coined the word “Parian” to suggest Paros, the Greek isle. 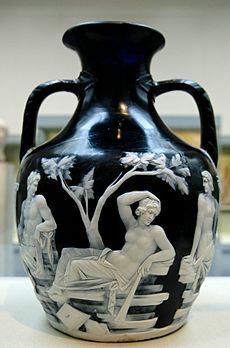 Popular forms produced were portrait busts of notables such as Shakespeare, Disraeli, and Napoleon but the Victorians favored pitchers and vases of various sizes and shapes. 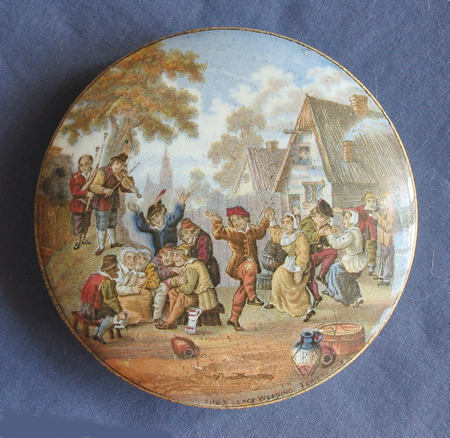 Potteries all over the British Isles produced Parian. 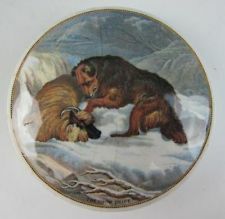 Leading makers of it included, Copeland , Minton, Worcester, Wedgewood, Goss and others. 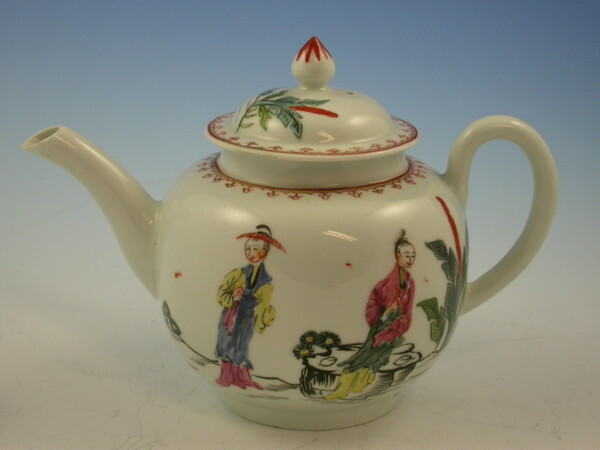 Below is an example of a Salt Glazed Stoneware teapot made in Staffordshire painted in enamels c l750. There are many Staffordshire potters too numerous to add here but you can look them up for yourself if you are interested. 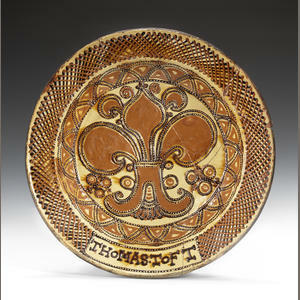 An Early Thomas Toft Slipware Dish. SOME TIPS TO LOOK FOR. Remember to look at markings either at the underside of an item or just inside the base rim. 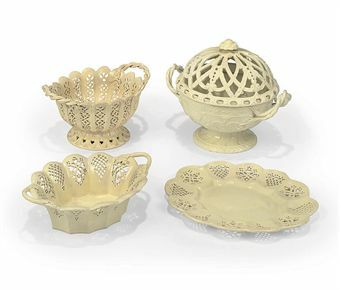 Porcelain is transparent as is Parian Ware when held to the light. 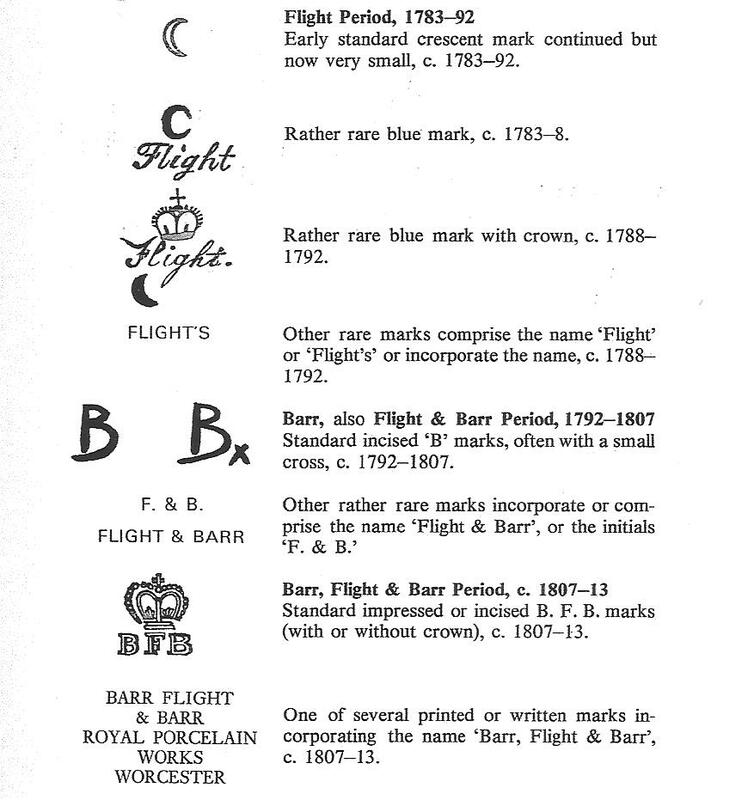 Be aware of fakes as well as reproductions by carrying with you when visiting antique shops the pocket book of marks as given below. 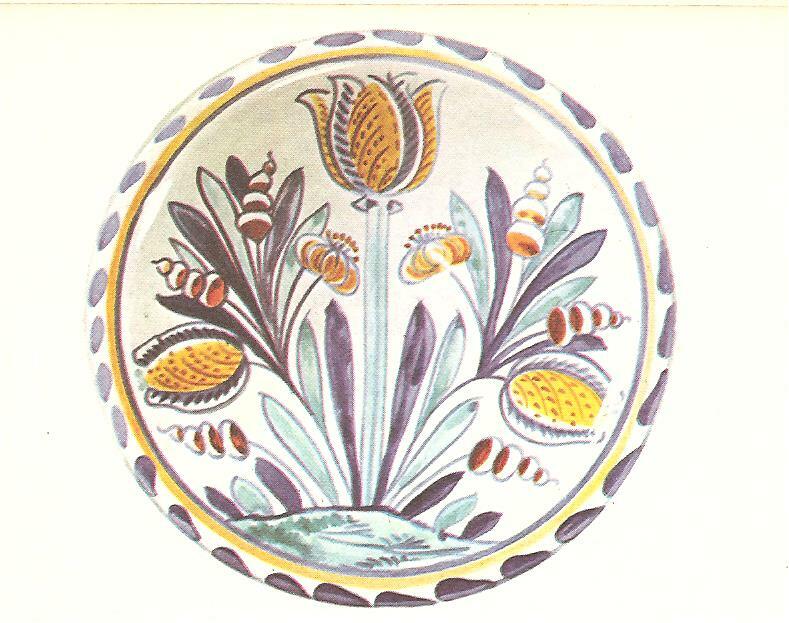 GODDEN – HANDBOOK OF BRITISH POTTERY AND PORCELAIN MARKS. Note:- There maybe a more up to date one now. ALSO -THE COUNTRY LIFE POCKET BOOK OF CHINA by G.BERNARD HUGHES. And lastly if you have any questions please ask. Some time ago,in fact, it was the year 1970 that I became interested in Antiques,so much so that I wanted to study them. 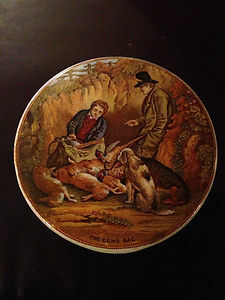 I began my research into the art of Ceramics and soon realised there was much to learn about this particular subject so I decided to enrol into the evening classes where Henry Sandon “Antiques Roadshow” was lecturing about Ceramics from the 12th to the 20th Centuries.This began for me as a hobby but I will come back to this subject at a later date, because todays post is about Pewter Tankards. Nothing looks better than pewter on old oak furntiture. Pewter looks right with it. 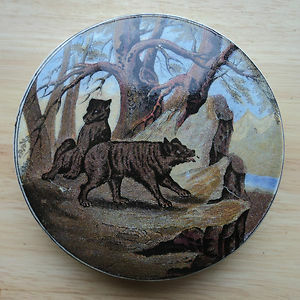 Take any black oak sideboard or dresser and try a couple of pieces of silver on it. No? 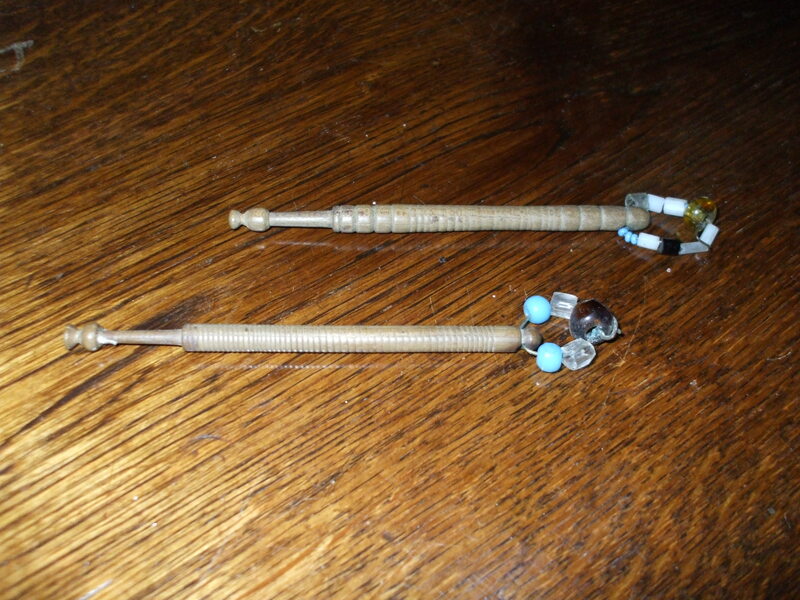 Well what about a pair of brass candlesticks. Yes that looks better you may think,but now try a couple of pewter tankards and you will see what I mean. Pewter is a delightfully warm,friendly alloy. If champagne should always be drunk from a silver tankard,then beer should be drunk from a pewter one,ideally with a glass bottom,so you can see if any enemy comes through the door while you are drinking;We are talking about past days of course. 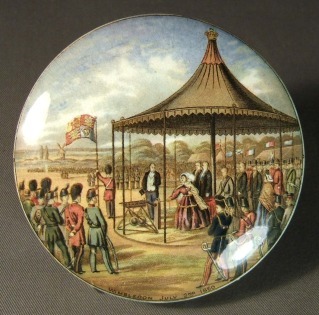 Or as another version has it so that if the recruiting sergeant or the press-gang leader drops the monarch’s shilling into your mug you will spot it before you finish your beer and will not find yourself an unwilling conscript. 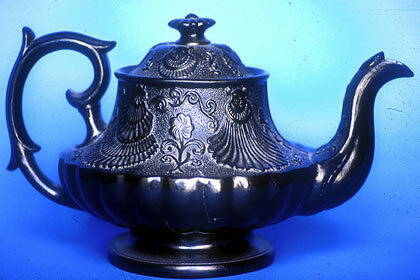 The first English pewter is Romano-British and dates back as far as the year 400 B.C. 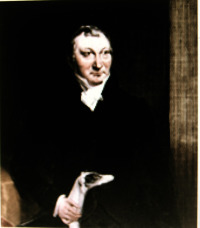 Then suddenly, for no apparent reason,this delightful alloy,comprising 90 per cent Cornish tin and 10 per cent lead,copper or antimony,fell out of favour and did not make its re-appearence until the 14th century.Pewter tankards began to make an appearence during the 16th century..
Charles ll,as one of his many methods of aquiring wealth without recourse to Parliament ,took to annexing the silver of his nobles,who tended to replace it with pewter, rather than risk losing the replacements the next time the King came to dinner.It was, however some years before the merry monarch ascended the throne,about 1635 in fact, that pewterers began to use marks, in addition to their own touch marks,which are very similar to silver hallmarks-causing therby much wrath and so little litigation on the part of the Goldsmiths’ Company. 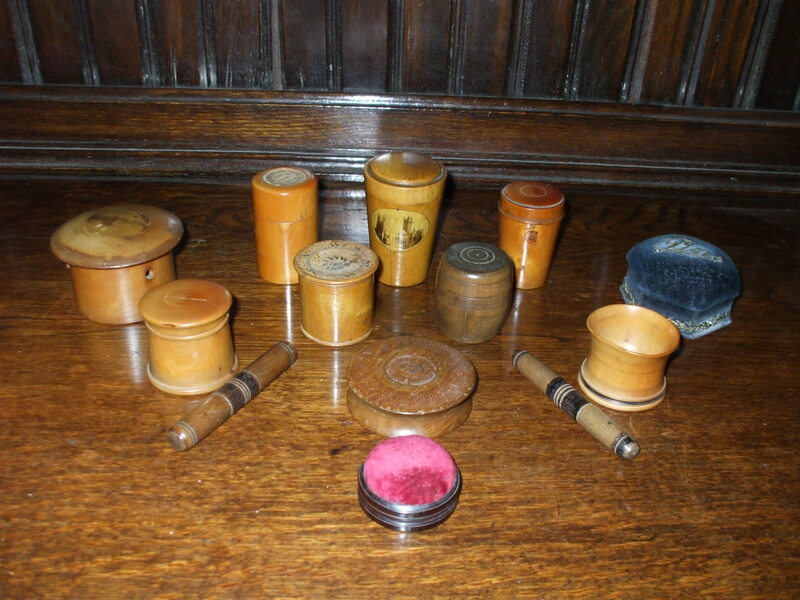 Tankards,flagons and similar items are, however, datable by shape, and any markings which provide confirmation and additional information are all things to look for if you are contemplating starting a collection. 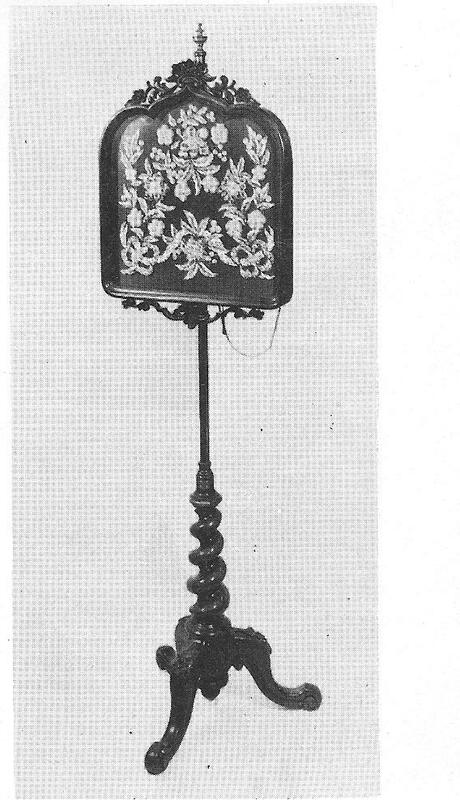 As a matter of fact,the touchplates recording the touchmarks of pewterers before 1666 were lost in the great fire of London. 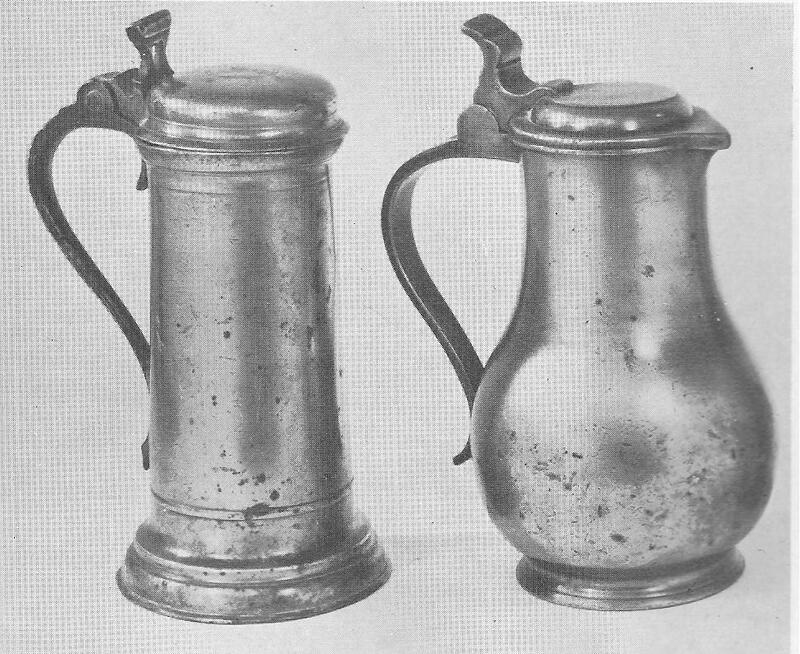 The earliest pewter tankards were squatt,straight- sided and tapered upwards,with flat lids,usually hinged with ornamental thumbpieces,although even more desirable pieces were made at the same time with cylindrical instead of tapered form. 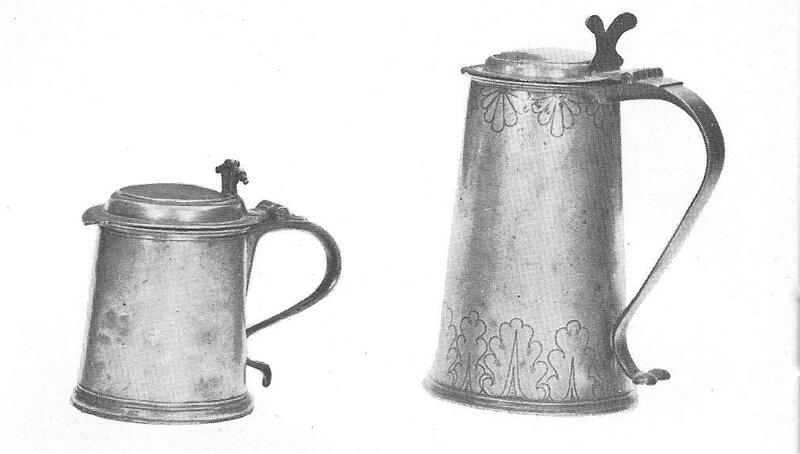 Towards the end of the 17th century ,lidless tankards also put in an appearance,designed for ale-houses , and many of those which servive today carry engraved on the body the name of the hostelry they adorned .A century later an American living in London recorded that it was possible to send to the pub for beer,which would be brought by the servant of the ” tap-house”, complete with pewter mugs bearing the owners name,and that each morning the same servant would go from house to house collecting the mugs, which he strung on a leather strap for ease of transport. 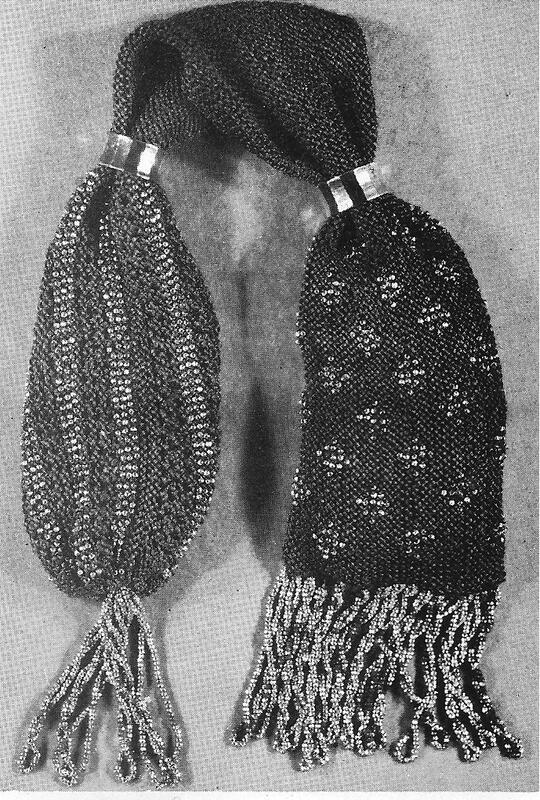 Coming back to the earliest tankards, the flat covers were sometimes embellished with saw-tooth serrations at the front,so that when the domed cover came into vogue at about 1690,this practice was continued, and remained until the beginning of the second decade of the 18th century. About the time that these serrations were unfavourable the plain drum of the tankard gained the embellishment of a fillet moulding about two thirds down its body. 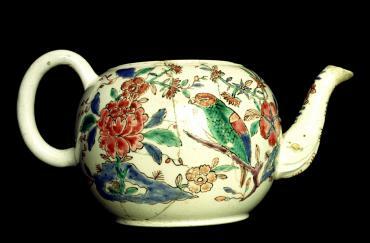 which remained until around 1725,when the straight- sided tankard began to be replaced in public favour of the bell and tulip shapes. 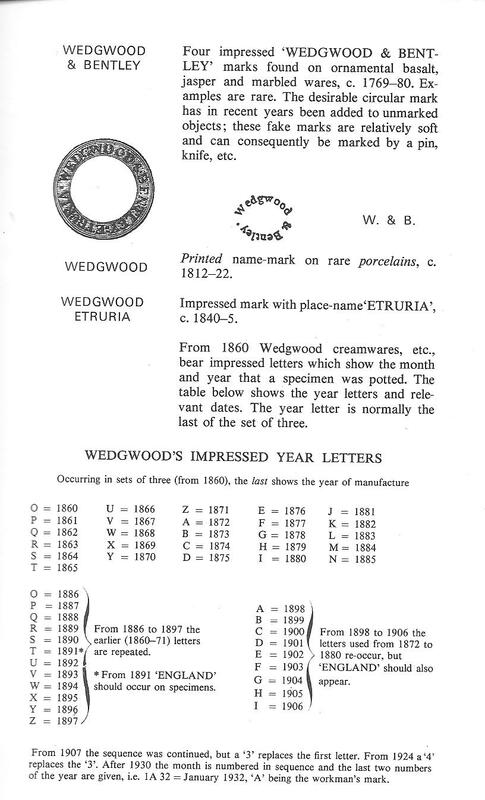 These shapes were especially popular in the West of England,and Howard Cotterell’s Old Pewter, Its Makers and Marks(Published by Batsford,London in 1929 and reprinted in 1963), which has been regarded as the pewter collector’s Bible for many years remarks that 80 per cent of early tulip tankards bore the touch-marks of pewterers from either Bristol or Exeter. 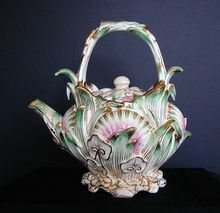 It did not take long for these new shapes to catch on,and although the domed lid fell out of use at about 1775, the tulip and bell shape remained in favour right through the 19th century, getting even more swag-bellied as time passed. Glass bottoms appeared about 1895. 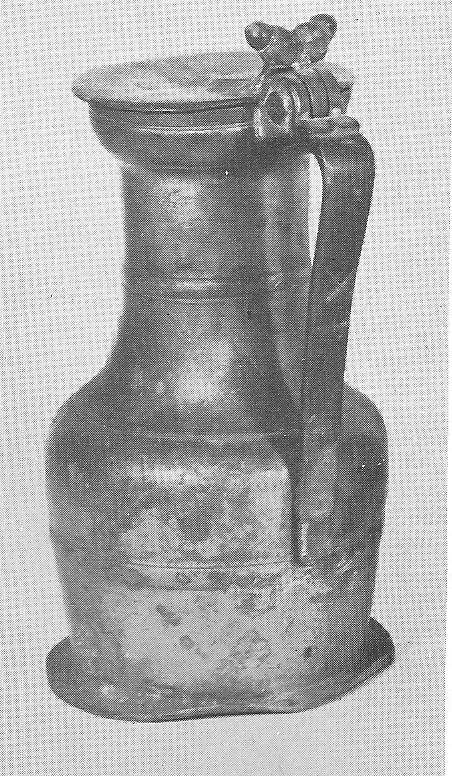 A ten and a quarter inch cylindrical lidded flagon with scroll handle and open shaped thumb piece and domed cover.It dates from the first half of the 17th century. 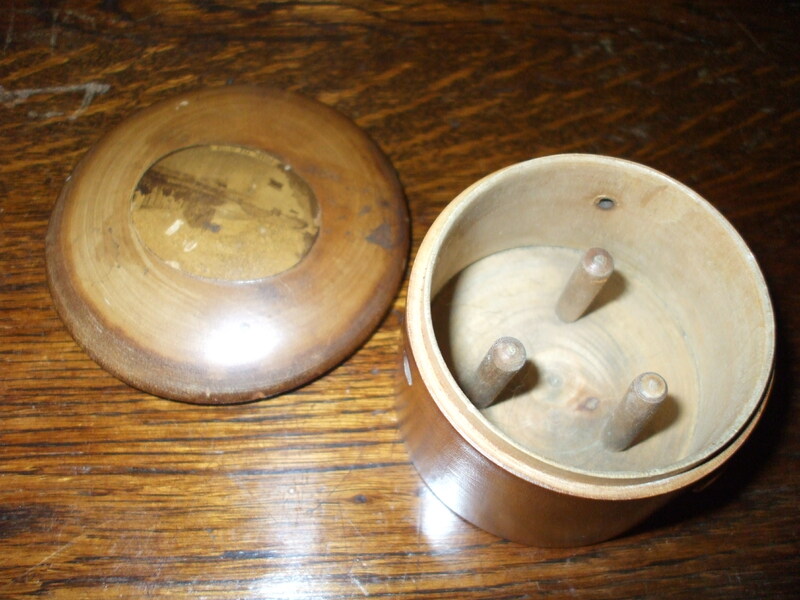 The bulbous shape next to it suggests its 18th century date and is probably German. 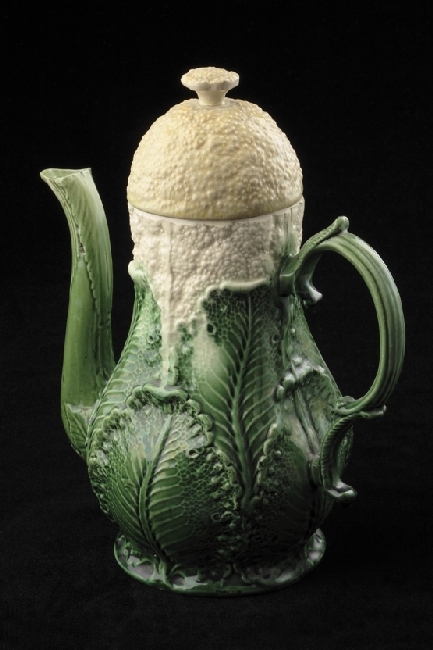 A lovely wine flagon(“Kelchkanne”) by Jacob Valin of Geneva,the collar surmounted by a heart- shaped cover with a twin- acorn thumbpiece. 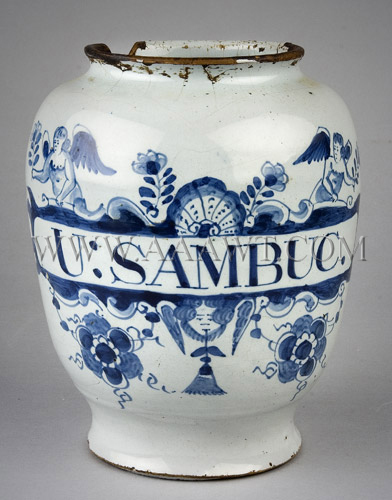 This mid 17th century flagon height 9 3/4″ changed hands at an auction on June 19th in 1973 for 200 pounds. I guess the value has risen substantually since then. Above a 7″ William and Mary tankard c 1790 with the makers mark ” I. 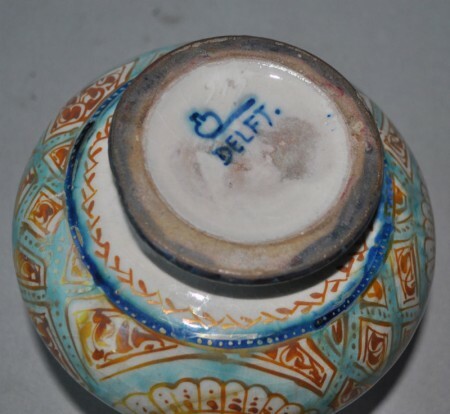 B ” and a good flat lidded flagon by “W .W” c1690. The William and Mary tankard sold for 250 pounds and the flagon 540 pounds on June 19th 1973. Anyone wishing to collect pewter today will have to search for bargains which sometimes can be found at car boot sales or antique fairs, but before you do, research your item thoroughly there are plenty of books on all subjects to do with the antique world. 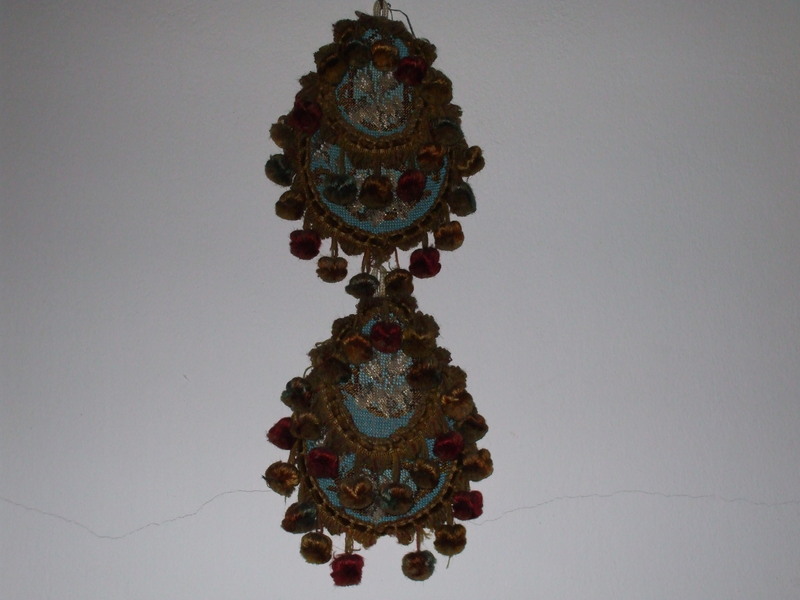 Check my blog for further post about the recognition of antiques. With regards to the cleaning of old pewter tankards is simple and logical.If it is going to be used,it has to be cleaned.If it is purely for ornamentation it is not necessary -and with a really old piece it is downright foolish Why! because you will remove the patina it has aquired over the years,just a gentle wipe over with a soft cloth will suffice..However major cleaning jobs should be done by experts. 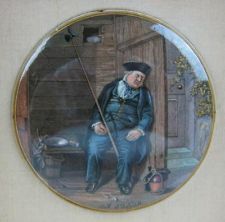 As regards to the future, and the present less wealthy collector,Victorian pub tankards,with the name of the pub usually engraved on the bottom,though once despised are going up in price but worth while collecting, also as the supply of pewter gets smaller,and correspondingly more expensive,Brittania Metal must surely now be an antique of the future.